The first Episcopal church service in Bismarck was held in the Capitol Hotel on March 8, 1873, when James Humbert, infant son of Lt. and Mrs. Humbert of Camp Hancock, was baptized by the Rev. Charles Swift. Soon after this service Bishop Clarkson of Nebraska made a visit to Bismarck. In the fall of 1877, Bishop Clarkson appointed the Rev. J.A. Graham of Brainerd, Minnesota, to conduct services in Bismarck on the third Sunday of each month. The church service was held in the old city hall located on the east side of Fourth Street between Broadway and Thayer Avenues. The ladies of the congregation organized a New England dinner which earned them $200. This encouraged them to continue with the organization of the church. In 1878 the Rev. Miller became the first resident missionary. Church services were conducted in a new brick schoolhouse located where the Provident Life Insurance building now stands and the Protestant Episcopal Church of Bismarck was organized. At the request of Bishop Clarkson, the Board of Directors of the Northern Pacific Railroad deeded six lots to the church. These lots were located on the northeast corner of Mandan Street and Avenue A and cost a total of $30. The construction of a church building was completed by June, 1881. Given the name, The Church of the Bread of Life, the first Episcopal church of Bismarck was consecrated on Whitsunday by Bishop Clarkson, assisted by the Rev. Dr. Batterson of Philadelphia. The cost of the building was $2000 without furnishings. In 1887 the church's name was changed to St. George's Episcopal Church. People thought the name, Bread of Life, made people think the church was high church, an idea which they did not wish to promote. Around the turn of the century the church building was moved to Third Street and Thayer Avenue. This old historic church building has been moved from that location to Camp Hancock, where it has been preserved and is now open to the public and used occasionally for special services. It was in April 1938, that a new church was discussed with Bishop Atwill and in 1941 Mr. H. M. Leonhard, an architect and member, was invited by the vestry to develop plans and estimates for the new building. Construction was begun after the war. 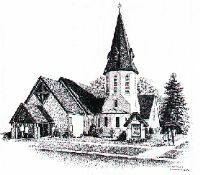 On September 10, 1949, the members of St. George's parish attended the first services in the new church, now called St. George's Episcopal Memorial Church. The church building is noted for its many memorials and especially the stained glass windows that include fragments of glass from English churches. These fragments, some of which date back to the 11th century, were painstakingly picked up and cataloged from the rubble of bombed and destroyed churches during the Second World War. The church has remained essentially unchanged since its construction except for two improvements. St. George's aging organ was replaced by a Moller pipe organ in 1986. To accommodate the new organ in the sanctuary, the altar was moved forward closer to the chancel steps. More recently, an addition containing an elevator, coat room and updated restrooms was completed in order to better serve both present and future members of the congregation, and ensure that all can participate fully in church activities. The congregation looks with pride and thanksgiving on the accomplishments of their parents and grandparents and looks forward to the challenges of the future.